Every web design is tailored exactly to your business. We want to get to know your business, understand your needs, and help you achieve your business goals. 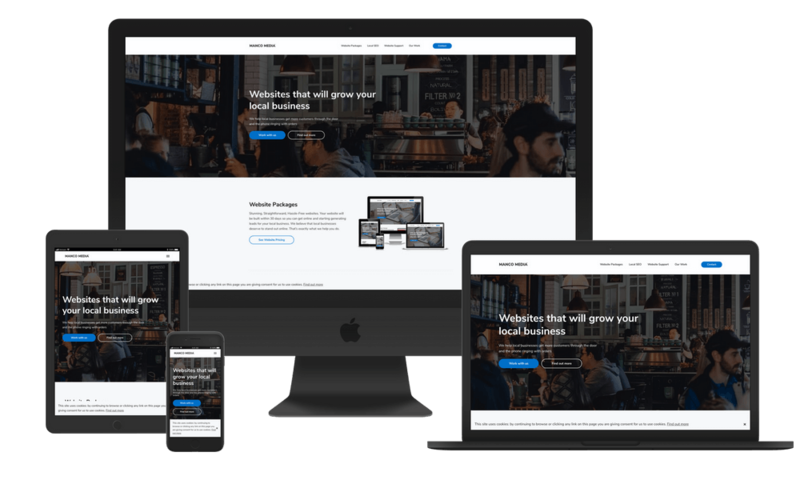 Our expert web designer & marketer uses cutting edge technology & best practices to create mobile-friendly websites that generate high quality leads and sales for your business. We love providing a truly personal service to make sure you're 100% happy. Website works perfectly on all devices. Google ranks websites by how well they work on mobile. Having trouble deciding on a package? Give us a call to talk it through. What if I need something outside of the website packages? It depends on the package that you've chosen and whether you have quality content ready before we begin. We aim to deliver your smart website within 30 days after receiving all of the information and content/images etc that we need. Will my website work on mobile, tablets and computers? Yes, all of our websites are fully responsive - meaning they have been tested and work on all modern devices. The screen will shrink to fit any device it's being viewed on. We will install Google analytics software on your new website and show you how to log into your Google analytics account where you can see a wide range of statistics about your website including number of visits, quotes and contact submissions and the amount of time people are spending on your website. We recommend Managed WordPress hosting - mainly for security, speed and performance reasons. There are many companies out there that offer hosting, we have tried many of them and believe that Flywheel Hosting are one of the best. That's why we only build websites on Flywheel Hosting. What happens if I want to add some features to the website that aren’t included in the plan? Whilst we like to be flexible and responsive to your needs, we also like to deliver what we promise within the timeframes and budgets we have allowed. If you ask us to add new features to your website while we are building it, will most likely ask why? If we all agree that your new request will help us achieve our objectives then we will be more than happy to oblige. There maybe an additional cost to add the new feature depending on what it is. Once your website is launched, we will provide 30 days of support to make sure any bugs have been ironed out and that you are confident using your new website. After this you will need to subscribe to one of our ongoing website support plans to make sure your website is looked after and maintained. These website support plans include updating your software, regular backups, security checks and making sure your website is online and open for business 24/7/365.